I fractured a bone in my foot over the weekend, while playing basketball with my 14 year old son. This week has been all about doctor visits and phone calls, x-rays, getting one of those plastic walker boot things, and borrowing crutches from good friends. Oh well. At least my job doesn't require feet. A while ago I designed some digital stickers for Apple's iMessage app. Now Apple is using (with my permission!) one of my drawings in a TV commercial for the iPhone! It's my boombox with arms and legs drawing, and it appears during the last 5 seconds of the ad. We made socks! Two kinds! There is a 'super duper' pair, and a pair that will give you super powers. Put these on and maybe, just maybe, make your day a little bit better. These socks are sooooo super duper, it says so twice. 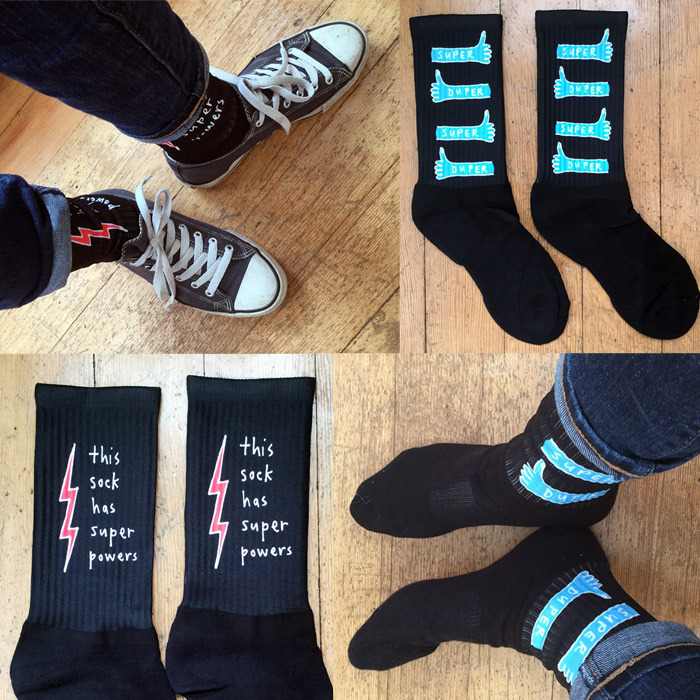 These socks have super powers. It must be true, it says so right on the sock. Drawings for $40 each. Only until December 4. Yes! I'm offering original drawings for just 40 dollars each, for a limited time. Get them here. These are multiple originals, meaning that I will draw & paint multiples of each piece. I'll make each one to order, and sign it. But after December 4, that's it, no more. I've done this a couple of times over the last 2 years. I love the idea of getting an original piece of art into your hands for an affordable price. Doing multiples allows me to make that happen. These are made with the same artist-quality materials that I use for my other artworks. I don't want to rush you, but don't wait too long to get one (or two). I'm only taking orders til Dec. 4! My very first wall calendar! This is something we've been working on for weeks and weeks in the studio. Each month is printed on an individual sheet, and the whole calendar is held together with a silver binding clip. This allows you to put the current month in the front, remove individual pages and use them as prints, or display them however you want. Use the included clip to hang it on a wall, or pin it to a cork board or cubicle divider. The calendar is printed right here in Victoria, Canada by some really nice people. It's kind of like getting 12 prints for $25. I can ship these anywhere in the world. I tried to keep the price of the calendar reasonable, especially to offset shipping charges that can be a little high for my overseas friends. I'm really happy with how these turned out, and it gives me some gusto to make more things. Get yourself a calendar right now. My artwork is now available as digital stickers in the Apple App store, for use in iMessage. You can get them here! Get them in the App store here. You can also find them in the App Store by doing a search for "Marc Johns". Not sure what the price is in other countries. So excited to tell you that my wife Kristen and I are working on a children's book! We've been talking about making a book together for ages and ages and we are finally taking the plunge. More to share soon! Hey local Victoria people! I'm giving a talk this coming Saturday night at Poppet Creative. It's going to be about how I became a full-time artist thanks to the craziness of the internet. Get details and tickets here. There will be a Q&A afterwards, where you can ask me anything. There will also be refreshments (snacks and wine)! Where: Poppet Creative, 1508 Haultain Ave., Victoria, BC. I am so happy and excited to tell you about a new, small range of products in collaboration with Department Store for the Mind, a new venture founded by Sophie Howarth. It is an emporium of beautiful objects for thoughtful people. And here's a special discount just for us: use coupon code 'firstaid' and save %15. They did a little interview with me which you can read here. This project was such a great fit from the start. I often draw things that are reminders to myself to lighten up, focus on the good things, etc., and they often end up resonating with others. So to work on a project whose goal is to create something fun, a little uplifting and encouraging, and often cheeky, was perfect. See the whole collection here, and don't forget to use coupon code 'firstaid' and save %15. 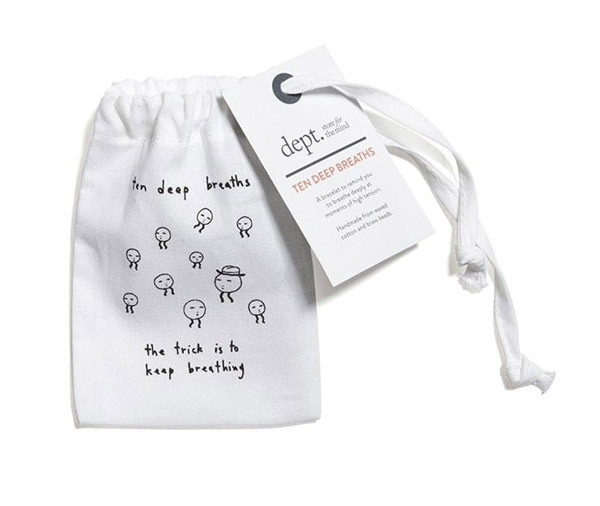 Department Store for the Mind will be setting up a pop-up Christmas shop in Old Street Station in London, UK, from Dec. 15-23. So if you are in the area, stop in and say hello for me. For a limited time, I will personalize one of these drawings for you. I often get asked to make custom drawings. But the problem with personal commissions, is, well, they're personal. People ask me to draw their aunt, or their dog, on an homage to a friend. I can't do that. But what I can do is change the text, like I am for these drawings, and still keep them consistent with my style. Select one of these drawings, select a caption from a drop-down list, click 'Add to Cart', and enter a person's name. It could be your name, or someone else's (a cool gift, perhaps?). Each drawing is a unique work of art. I will draw and paint it especially for you. It will look like the pictures here, more or less (each one will be a bit different). These are some of my favourite things to draw. And the encouraging ice cream cone was my most popular drawing last November when I offered 'multiple original' drawings, so I had to include it.